Home » 2017 Top Half Folk Festival » Where is it? Glen Helen Resort, Namatijira Drive, is approximately 140 kms along the bitumen, west of Alice Springs. The homestead is set on the banks of the mighty Finke River, with spectacular views of the Western MacDonnell Ranges. The Gorge and waterhole are a few minutes walk along the river bed. Head west out of Alice along Larapinta Drive, past Simpson’s Gap and Stanley Chasm, keep going and then turn right onto Namatijira Drive. Follow signs to Glen Helen. 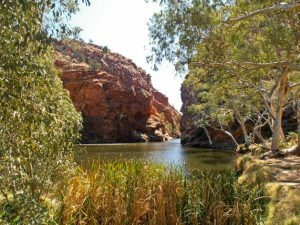 You may like to stop at Ormiston Gorge on the way.